A few weeks ago, I had the privilege of being able to go to the Franklin Institute in Philadelphia to see the Dead Sea Scrolls. The Franklin Institute is one of my favorite places in Philadelphia, so I’ll be sure to post about every aspect of it. The Dead Sea Scrolls, however, was a special exhibition that was only there for a few months. The exhibit features multiple artifacts from over 2,000 years ago. They showcase life in ancient Israel, showing how they lived religiously and their everyday life. There’s hand-crafted pottery so well-preserved you can see cracks and stamps made in the B.C era. It’s breathtaking to look at these antique pieces and realize you’re looking at something from thousands of years ago. It also features some of the earliest known texts of the Bible, some of which have never before been on display. A piece of the Western Wall is available for prayer requests, all of which will be delivered to the full Western Wall in Jerusalem. It’s an amazing way to connect to faraway places from generations ago without leaving the tri-state area. Overall, this is an amazing must-see exhibit. I do, however, have to warn you about two things—first, the sooner it gets to the closing date (which is October 14th) the more crowded it gets. I would recommend buying tickets in advance and being prepared to deal with large crowds. Second, due to the fragile nature of the display, it must be kept cold—very cold! I would recommend bringing a sweatshirt or sweater to make yourself more comfortable. As I’ve said, the Franklin Institute is one of my favorite places to be, so I’ll be sure to blog about all the other exhibits over the next few weeks. The first fun thing I did was go to the Philadelphia Zoo in early July. Located in Fairmount Park, America’s first zoo now boasts housing more than 1,000 animals—many of them rare or endangered. As soon as I arrived with my mom (we were supposed to meet my cousins but they ended up not being able to make it) we saw the cheetahs. I’m a huge fan of any cat, so I was ecstatic to see them. Next, we walked down to the Bald Eagle—where my mom was so overwhelmed with national pride she began singing our national anthem. It was nerdy and slightly embarrassing, but it’s also why I love my mom. As we were walking, we passed camel rides and pony rides. Some of my best childhood memories happened on those camels or ponies, but I unfortunately think I’m a little big to be riding them now. The zoo also has face painting, a carousel and children’s zoo if you’re looking to go with your kids. Our next stop was Big Cat Falls, where the lions, tigers, jaguars, leopards and pumas live. It’s set up to feel like you’re actually in the cat’s natural habitat. As a feline fan, I was overly excited to see the cats, and, like always, I wasn’t disappointed! We got to see lions up close, a tiger lying against the glass, and pumas roaming the exhibit. Big Cat Falls is right next to the Primate House, so we ran in immediately, and I must say I think the monkeys are quite possibly my favorite zoo animal. They’re so humanlike! I think I could sit and watch them for hours. 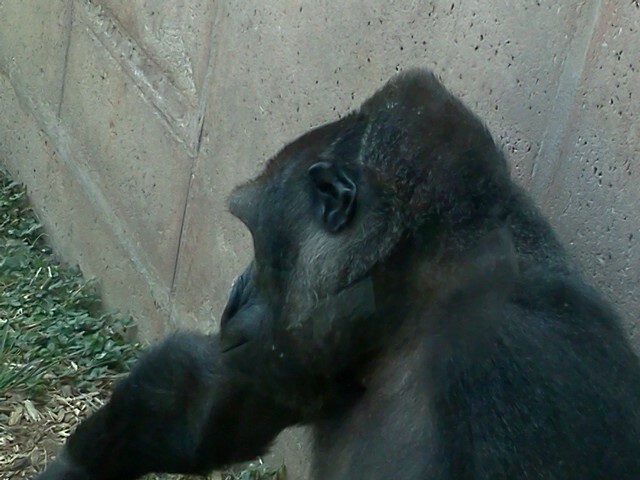 The gorilla was sitting right up by the glass, so we got an awesome close up—I included a picture. The zoo also recently welcomed a baby orangutan, and as we were watching the mother brought it right up to the glass and started cuddling it! As if that wasn’t cute enough, the baby leaned forward and kissed its mom. Cuteness overload! Next was the Tortoise Trail. 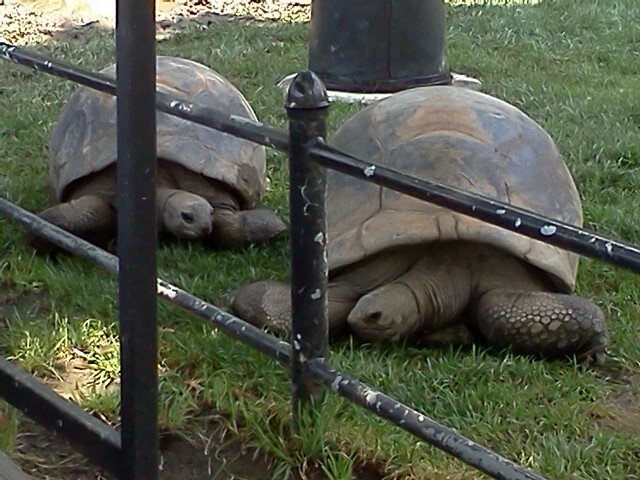 The tortoises were so big, it was hard to believe! I attached a picture of them too. By then we were starting to get tired, so we walked by the flamingos (which looked almost like lawn ornaments!) to get to Bear Country. There, you can see polar bears, black bears and grizzly bears. The grizzly bear seemed to be angrily pacing back and forth, but we knew we were safe behind the glass. The polar bear exhibit is, to me, very cool because you can choose to walk up and view it from above water or watch it swim through the water depending on where he is. The polar bear didn’t seem very playful when we were there, so we just let him be. We visited the giraffes and zebras, and even got to see the giraffe bend down to get a drink from his pond—too cool! I really like giraffes and zebras too, so I was happy we got a chance to see them. Our last stop before we left was the Children’s Zoo. Normally we like the feed the goats and sheep in the petting zoo, but that day only one goat was out—a little disappointing to be honest. Overall, we had an amazing day at the zoo. Even though it’s located in Philadelphia, it’s very close to Southern Jersey—less than half an hour from where I live. Although for some it may be a little bit of a long drive, I would definitely recommend it; it’s not only educational but also a great way to spend the day. My only complaint? Parking was atrocious; we were pointed in three different directions and when we were *finally* pointed in an actual lot, it turned out to be full despite the fact that the attendee was still letting multitudes of people in. But, don’t let that deter you from visiting the zoo!